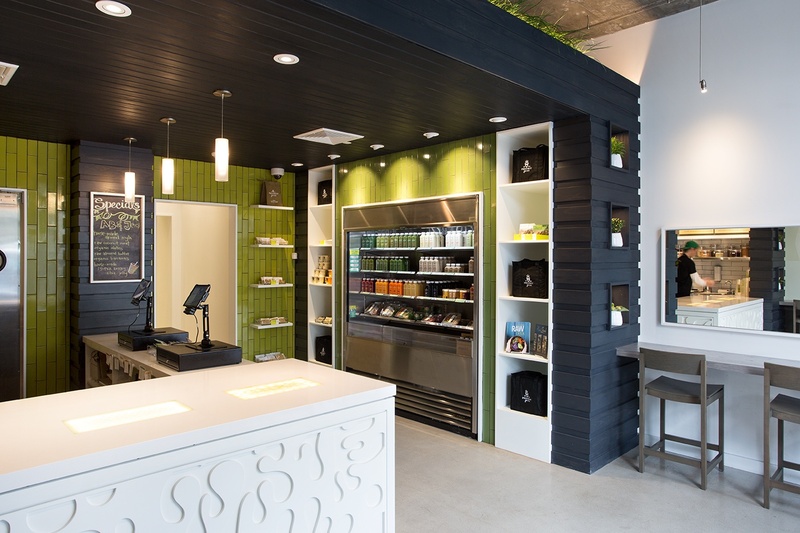 Looking to expand upon their successfully established fleet of fresh, cold-pressed juice bars, husband and wife owners Greg and Rachel Malsin tasked zero ten design to develop a new look and feel for their superfood smoothie bars. 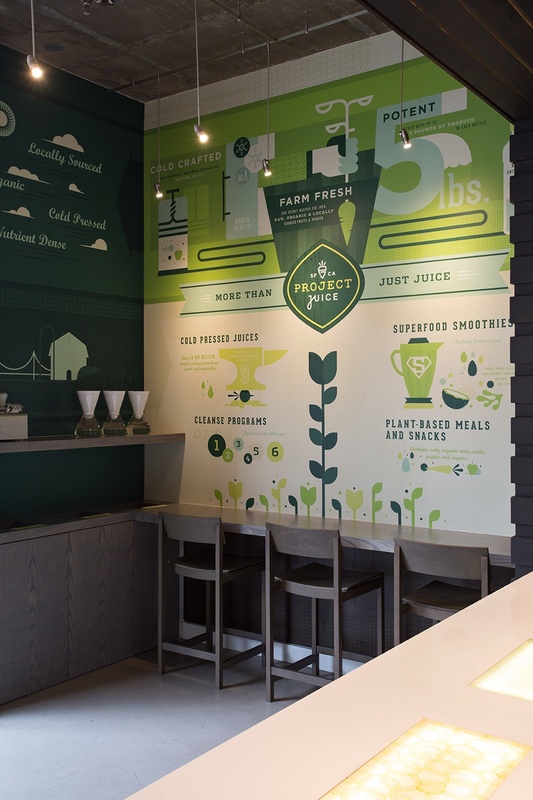 Bolstered by new graphics and an elevated brand message, our team made a decision early on in the design process to step away from the traditional juice shop design, which has over the years anointed rustic, reclaimed wood as the symbol of organic and healthy food. Instead, we stepped back and looked at their product, to better understand how it was prepared and sold, as a springboard to help us design the next generation of their retail experience. As a part of our zero-to-ten research process, we toured Project Juice’s state-of-the-art production facility and one of the things we learned was that their cold-press machines are specifically designed to extract only the best juices and nutrients from the organic fruits, nuts and vegetables they process. 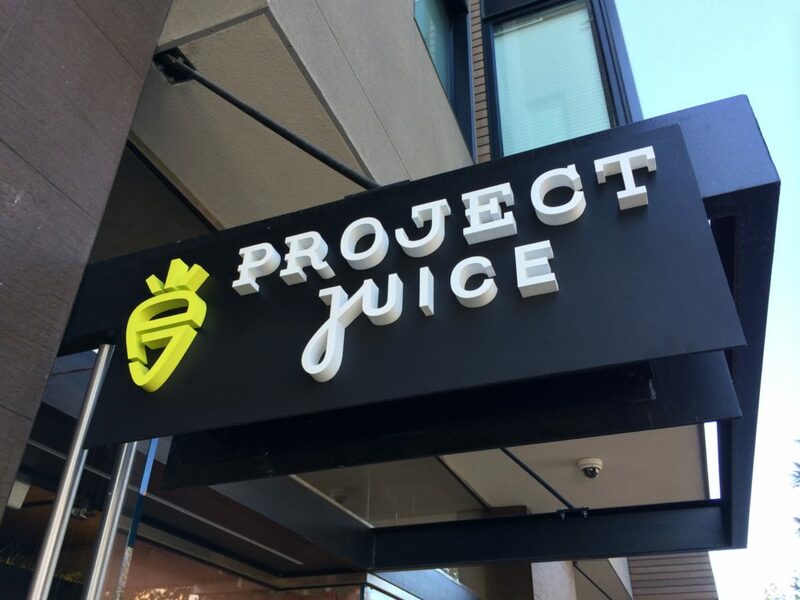 This methodical and time-consuming procedure results in one of the cleanest, healthiest, and freshest bottles of juice in the industry, and is a critical element of Project Juice’s success, not to mention an integral element of their brand promise. It was important to convey this in their new stores going forward, and to educate their client about how their juices come to life. To do so, we opted to re-fresh the entire existing material palette, while still being innately recognizable as a Project Juice. 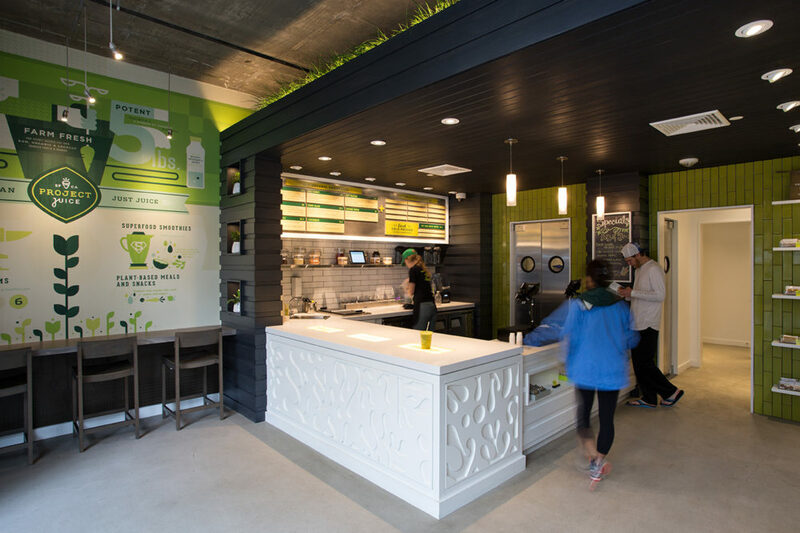 So we went with a modern spin on the ‘crate aesthetic’ prevalent in traditional juice bars, including their own, and a created ‘room’ of dark stained pine that only subtly recalls a produce crate. 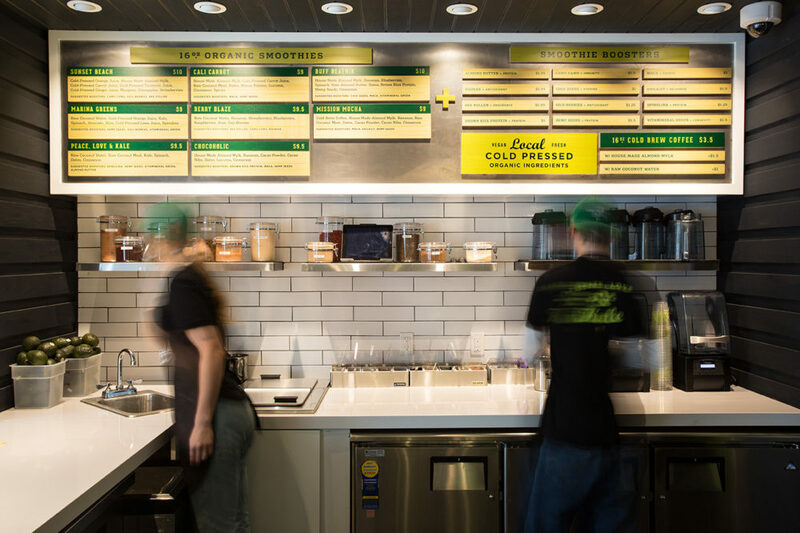 This room serves to bring the customer fully into the Project Juice realm, allowing them to focus on the eye-catching pops of color of their food line, smoothies and bottled juices, all standing in heightened relief against the dark wood and handmade green and yellow clay wall tiles. A crisp, bright white sales counter makes reference to the clean flavors of their product line, while intricate detailing, such as ginger-shaped laser cut panels and inlayed backlit glass tiles of pressed, dried fruit reinforce Project Juice’s commitment to fresh and healthy ingredients. 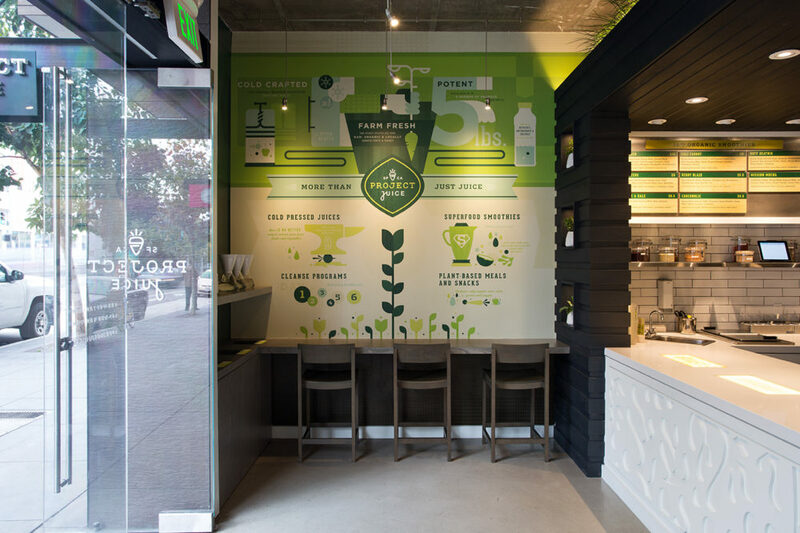 Colorful infographics help to not only greet, but also to educate patrons about the cold-pressed juice process, and light gray, stained ash countertops provide indoor seating awash in natural daylight from a floor to ceiling glass storefront. All of these elements come together to form a unifying clean and modern look that reinforces the brand promise of serving the freshest organic juice and smoothies possible and become signature components that Project Juice can utilize as they grow into future locations.